Front: Before WWII, there were 43 communities in California that had Japantowns. These three, San Francisco, San Jose and Los Angeles, are all that remain today and are listed on the front of the t-shirt. Don't let these last historic Japantowns disappear. 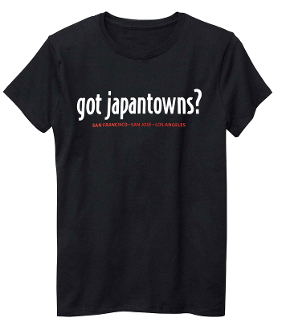 Back: The group of lost Japantowns are listed on the back of the t-shirt in the shape of the state of California. Don't let our last three Japantowns join this list on the back of the t-shirt.